RAMAKRISHNA MISSION VIVEKANANDA SMRITI MANDIR, KHETRI organized foundation laying ceremony for restoration and conservation of the historic ashrama building ‘Fateh Bilas’ and setting up of ‘Vivekananda Museum’ on Tuesday, the 4th October, 2011, at 4:30 pm by Sri Ashok Gehlot, Chief Minister, The Government of Rajasthan, in the presence of Dr. Jitendra Singh, Minister of Energy, Information Technology & Higher Education, Government of Rajasthan and Sri Shishram Ola, Member of Parliament. About 400 people attended the function. To make the people in general aware of the decade-long association of Swami Vivekananda with Khetri, to further spread the cultural and social messages of the Swami, to portray his life and time with realistic presentation through life-size and miniature Diorama, and to give a tribute to Swamiji on his 150th Birthday in January 2013, the Centre proposes to open a majestic Museum to be housed in ‘Fatteh Billas’ Palace building, Khetri. The building is intensely associated with the memory of Swami Vivekananda where he visited and stayed for a considerable period during 1891, 1893 and 1897 in close association with Khetri Raja and got his inspiration and support for visit to Chicago and participation in World Parliament of Religions which made him known so widely and brought national pride. On being gifted by then Raja of Khetri in 1958-59 the said building to Ramakrishna Mission, the Khetri centre is functioning there for furthering the ideology of Swami Vivekananda. 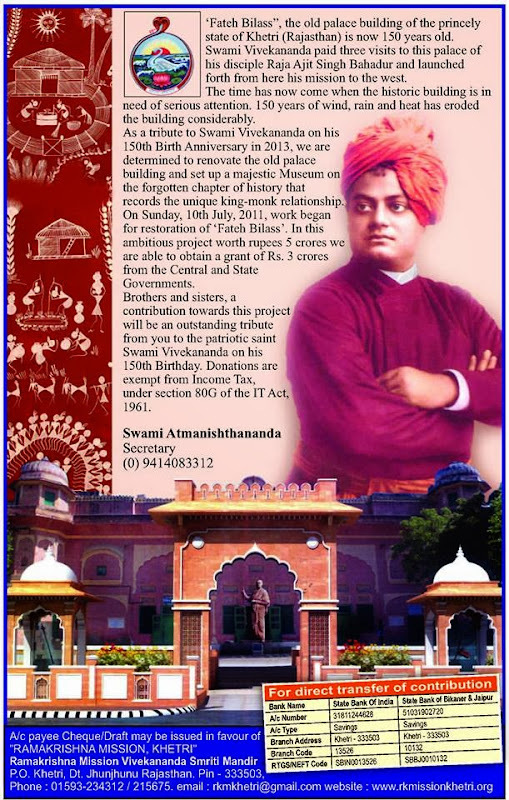 Considering the proposal of ‘Vivekananda Museum’ submitted by Ramakrishna Mission Khetri centre, sanction of financial assistance of Rupees two crores has been accorded by the Central Government under the ‘Setting-up, Promotion and Strengthening of Regional and local Museum’ Programme under the Deptt. of Culture, GOI, New Delhi. The Government of Rajasthan also declared a grant of Rupees fifty lakhs for the project in the last budget. While we express our gratitude to the Central and the State Government for their financial assistance, we would like to seek contributions from you, in whatever measure possible, in this ambitious project worth rupees 5 crores. It will be an outstanding tribute from you to the patriotic saint Swami Vivekanada on his 150th Birthday. We are fortunate in getting the expert help of Padmashri Dr. Saroj Ghose, who retired as the Director-General of the National Council of Science Museum in setting up the Museum. He is using his rich experience in conceptualizing the design, script and exhibit development of the ‘Vivekananda Museum’. (h) Work out a strategic plan for implementation of fabrication and installation work. “Certain men are born in certain periods to perform certain actions in combination. Ajit Singh and myself are two such souls—born to help each other in a big work for the good of mankind.… We are as supplement and complement.’ Swami Vivekananda wrote in a letter on 11 October 1897. Maharaja Ajit Singh Bahadur (1861–1901) was a ruler of the Indian princely state of Khetri between 1870-1901. He was a close friend and disciple of Swami Vivekananda. Swamiji paid three visits to Khetri (in 1891, 1893 and 1897), and it was from here that he launched forth his mission to the West, adopting the now world-famous name, “Vivekananda”. Khetri, which is presently a small town of Jhunjhunu district of Rajasthan, is redolent with the memory of Swamiji as some important events of his life occurred here. Towards the end of 1959, Raja Sardar Singh Bahadur, the great grandson of Raja Ajit Singh, made a generous gift of the old palace in which Swami Vivekananda had stayed, to the Ramakrishna Mission. In that old palace, Khetri Centre, the first centre of Ramakrishna Mission in Rajasthan is functioning. The palatial building has been named as “Vivekananda Smriti Mandir”, which houses marble statues of Raja Ajit Singh and Swami Vivekananda. The room at the topmost storey where Swamiji used to stay and had spiritual discourses with Raja Ajit Singhji, has been converted into a prayer room. The centre renders various social services and helps preserve the culture and spirituality that Khetri symbolizes. It is a phenomenal event in the history of Rajasthan that a great monk of Swami Vivekananda’s stature is so closely associated with a small princely state of Khetri. No other State in the country cherishes such a golden and historic link with this national leader. Unfortunately, the people in general are largely in the dark about this era. To make the people in general aware of the decade-long association of Swami Vivekananda with Khetri, to further spread the cultural and social messages of the Swami, to portray his life and time with realistic presentation through life-size and miniature Diorama, and to give a tribute to Swamiji on his 150th Birthday in January 2013, the Centre proposes to open a majestic Museum. The item is aimed at throwing light on the forgotten chapter of history that records the unique king-monk relationship and its impact on the local and national scene. It is also important that along with the setting up of the museum, the entire complex undergoes a process of comprehensive up gradation and preservation. I would like to seek contributions from you, in whatever measure possible, in this ambitious project worth rupees 5 crores. It will be an outstanding tribute from you to the patriotic saint Swami Vivekanada on his 150th Birthday. Of course, you know that the period between now and January 2013 is very short for the accomplishment of the task. I am counting on you to help us right now with a substantial gift. Donations are exempt from Income Tax, under section 80G of the IT Act, 1961. Please click here to know details on how to donate. Diorama for Proposed Museum is available here.